Lisa Armstrong reportedly refused to sign an NDA which is said to have left the divorce at stalemate in the latest development. 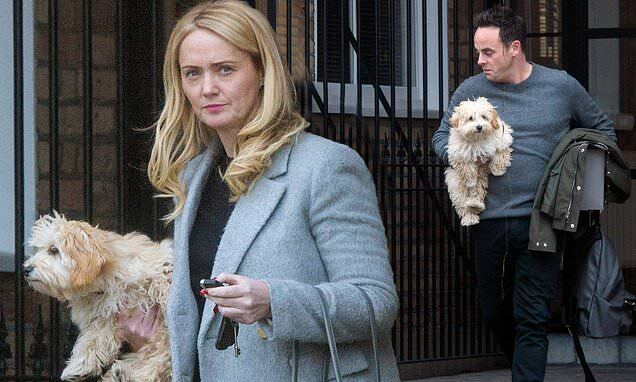 In their most recent Chiswick outing, Ant McPartlin, 43, and his girlfriend Anne-Marie Corbett, 42, carried one of their new Maltipoo's puppies each on Monday. The former PA had one of the fluffy pooches in one arm and her car keys in the other hand when she headed out with Labrador Hurley. Anne-Marie opted for a demure style in an ankle-length black dress which she paired with flat white trainers and a grey coat. Presenter Ant also emerged with the other Maltipoo puppy to hand as he ferried the curly-haired creature to the vehicle. The Maltipoo puppies, whom joined Ant and Anne-Marie's little family in February, were happily sat in the boot after the couple put them in the back of the car. The duo's romance has gone from strength-to-strength since going public last year, recently enjoying their first family getaway together with her two daughters. Ant's appearance comes after his divorce settlement with ex-wife Lisa has reportedly reached a deadlock amid claims she refuses to sign a NDA, according to The Sun. The TV presenter allegedly insisted that he will give his former wife her share of his multi-million pound fortune and has made several formal offers. However, insiders close to Lisa have since suggested that the make-up artist is yet to receive a formal offer from Ant's team regarding a settlement. Lisa was granted a decree nisi in October; however, talks have apparently reached a stalling point following the end of their 12-year marriage. The publication reported that the former couple's lawyers will meet soon at an arbitration hearing in a bid to bring the chapter to a close.